Here are just a few of the awesome toys The Real Toyhunters scored a few weeks ago. We stumbled onto a collector who has an enormous collection. Our first purchase involved 8 hours of sifting through countless boxes, bins and trunks in search of the more primo toys. It ended up with us hauling away about 250 vintage toys. 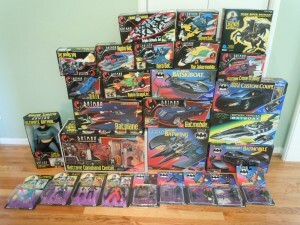 Below is a sampling of the 90’s Batman and Power Rangers toys that we scored recently. 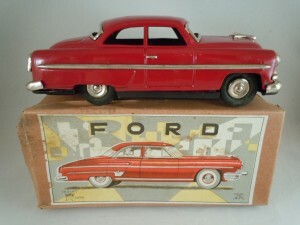 1950’s tin friction Ford Coupe made by Ichiko/Alps in Japan. In the original box and in near mint shape. Here’s another find from the same dealer. 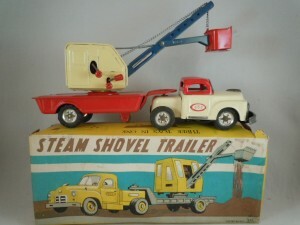 A 1955 tin friction Steam Shovel Trailer, also made in Japan by SSS. This one came in its original box and is in near mint condition as well. 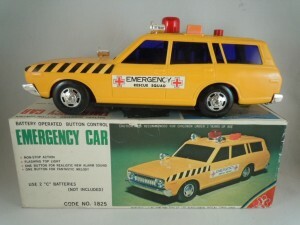 Last, but not least, is this wonderful 1970’s battery operated Toyota Crown Emergency Rescue Squad car. It delights with a whimsical siren and has the infamous “mystery action”… which basically means it runs all over the place until it hits a wall, and then starts the process all over again.